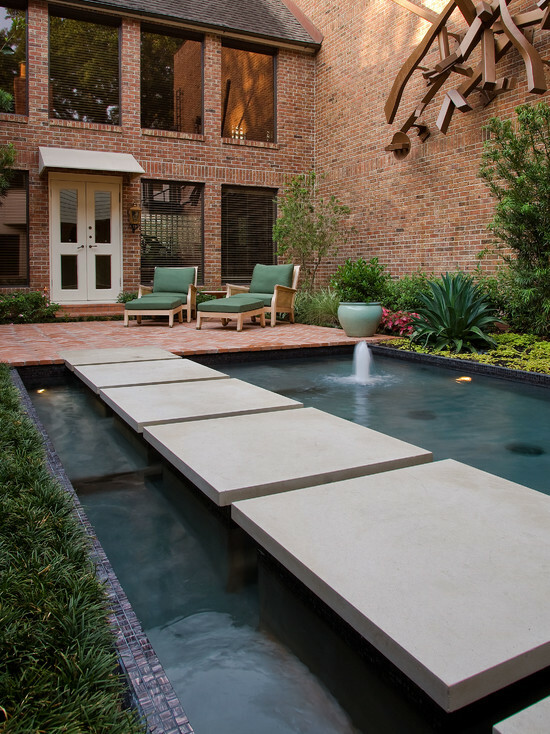 A River Oaks couple contracted Exterior Worlds to design a contemporary garden behind the gym in their two-story home. The original garden was very traditional in both style and function, and was used exclusively as an area to plant foliage and various species of flowers. Its only ornamentation was a three-tiered fountain, which looked outdated and made noise throughout the night due to failing pumps. Our clients asked us to convert a portion of this space into something more functional, and to create a more contemporary garden design throughout the remainder of the property. They also requested we replace the fountain with a more contemporary water feature. Because the garden had previously been designed in the shape of a near-perfect rectangle, we already had the basic geometry necessary for the development of a new, more contemporary style. We developed our landscaping plan by breaking this area up into proportional quadrilateral sections of varying size. Some of these would later be used as patio space, others as garden space, and the last and largest section would be converted into a far more sophisticated water feature and fountain. We began the project by building a red brick patio over the first section just outside the window of the home gym. Rather than placing the bricks in a standard, linear fashion, we took a more eclectic approach. We laid the bricks in alternating diagonal rows that created a sense of immediate movement the moment you stepped onto the patio. This had the effect of drawing both the feet and the eyes toward the center of the property, and it also served to immediately establish the garden’s new, contemporary design. In the large central section of the property, we created a rectangular koi pond the size of a small swimming pool. We deliberately built it to be the central, dominating feature of the landscape that would anchor all other garden elements. We built a two-inch coping around the pond, stocked it with koi, and installed lighting in the fountain’s corners at the end closest to the home. 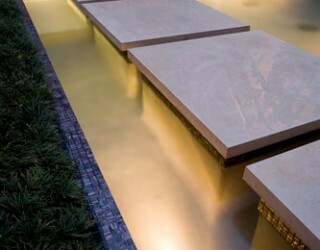 Our clients particularly liked this new water feature when it was finished. Neither of them were swimmers, but they had always enjoyed sitting by pools at the homes of friends. Now, they could sit by their own pond, and watch the koi fish swim around the lighted fountain. To further develop the contemporary design of the garden, we added several more important landscaping features and physical structures. We built another patio, identical to the first, at the opposite end of the pond. 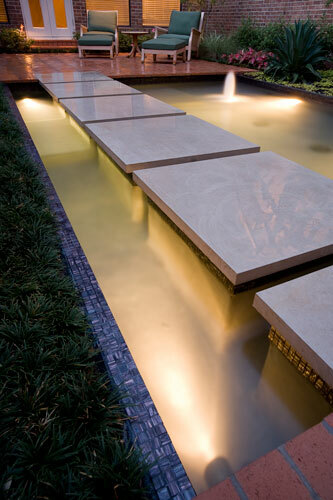 This framed the water, bringing a sense of balance and refined containment to the landscape. We also built a sculpture garden near one side of the pond to add an artistic element to the water, masonry, and surrounding greenery. To do all this, of course, we had to significantly narrow the perimeters of the garden itself, so by the time we finished our construction, there was no room left to install a walkway. Working with what we had, as opposed to what we did not have, we built the walkway across the water. 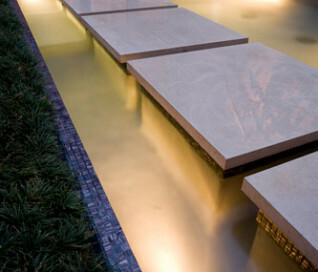 Large pedestals were placed in the pond, capped by large limestone pads that mimicked the effect of floating on water. These pads were large enough to support the weight of an adult, and provided both a means of transit across the pond, and varying points of observation from within the pond itself. 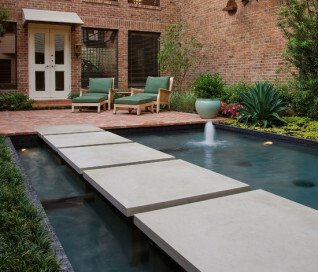 Contemporary garden designs like the one in this case study are typically a blend of geometry, natural features, and creative use of sculpture, masonry, or other man-made forms. The exact dimensions and layout of such a garden varies widely on a case-by-case basis. This is partly due to the fact that “contemporary” can refer to any number of progressive or eclectic concepts, rather than something definitive that can be identified as a specific artistic style or history period. Gardens designed in this manner often prove to be the most effective means of unifying a home with Nature itself, because forms that are both organic and inorganic are combined in new, innovative ways that blur the assumed boundaries between the natural and man-made, and create a new aesthetic based on natural tranquility combined with a passion for the eclectic and the progressive.